Youth in Arts will be open late on Friday as part of Art Works Downtown’s 2nd Fridays Art Walk in San Rafael, and we’ll be having a Fandango! Come play, sing and dance with us! Son Jarocho is a traditional music and dance form that originated in Veracruz, Mexico, at the beginning of the 17th century, blending Spanish, African and Indigenous Mexican traditions. The celebration in which people come together to enjoy and share Son Jarocho is called a Fandango. Our Fandango will be an informal “jam session” and we invite friends new and old to join us. Bring your dancing shoes, instruments, voices or just your appreciation! You can also see our latest exhibit, “Travel the World,” a giant pop-up book constructed with visitors to the Marin County Fair this summer that celebrates culture and art from around the globe. 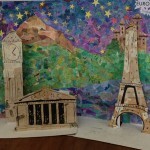 See the biggest pop-up book ever constructed, made by Youth in Arts with visitors to the Marin County Fair in July 2013 and learn about visual and performing arts from around the globe.